When you are in grade school you learn Columbus discovered America. In high school you find out it was actually Leif Ericson who was the first European who landed in America, about five hundred years before Columbus. Then in college you discover Columbus was a tyrant whose cruelty cost him his governance and may not be worthy of the fame we give him..
Quest for Flight is a college course revealing the truth of the history of flight. We have all been taught that the Wright brothers were the first to fly and North Carolina uses that phrase on their license plates. As this book details with excellent research, the Wright brothers were the first to fly an airplane under power, but not the first to fly an airplane. The story of John Montgomery is eye opening for its revelation of how he flew gliders long before the Kitty Hawk boys, and also reveals the true character of Orville and Wilbur. Like Columbus, we discover their character can be brought into question. Not only did they try to stifle competition in aviation, but actually tried to rewrite history in their favor. If one looks at the history of many inventions, it is easy to find one person or persons who get credit for an invention that many may have actually succeeded in producing. The telegraph is a good example, with Samuel Morse being credited with its invention, yet history shows many proir to him who used a similar device successfully. So it is not surprising to read about other flyers before the Wright brothers. What makes this book stand out is its account of their dishonesty. 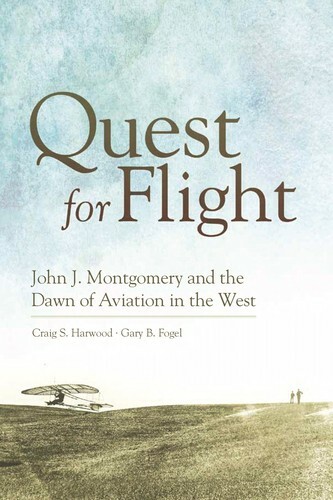 This book, however, is mainly about John Montgomery and the accomplishments he made in the field of aviation. As an engineer, he approached the problem of man flying very methodically and scientifically. His design of an airplane’s wing was a result of understanding the circulation patterns that flow over and under a wing that had never before been understood. Written in a very readable style, Harwood and Fogel have compiled a well researched, documented, treatise that pulls back the curtain on the history of aviaton. This is a must read for anyone interested in the truth of aviation history and my only question is, did David McCullough read this in preparing to write his book on the Wright brothers?.